1. The attainment of sound bony union without deformity. 2. The restoration of function, so that the patient is able to resume their former occupation and pursue any athletic or social activity they wish. To this might be added 'as quickly as possible' and 'without risk of any complications, whether early or late'. These aims cannot always be achieved, and in some situations are mutually exclusive. For example, internal fixation of some fractures may give rapid restoration of function, bul at the expense of occasional infection. 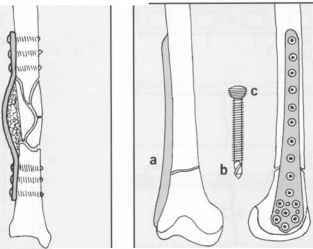 The great variations that exist in fracture treatment arc largely due to differences in interpretation of these factors and their relevance in the case under consideration: they are in constant flux, with on llie one hand the development of more sophisticated methods of fracture fixation and new antibiotics, and on the other the emergence of antibiotic resistant organisms. What are the aims of the fracture?